In 1926 the Hall Leys was described in a Ward Lock Guide. "Bordering the river on the eastern side are some attractive public gardens known as the Hall Lees, one of the pleasantest of outdoor lounges.The wide smooth lawns are bordered with well chosen herbaceous plants and flowering shrubs. There are many seats and a pavilion for shelter in wet weather. A band plays here in summer, and for a small sum tennis, bowls, croquet, skittles and fishing can be enjoyed". The cost of playing on Council run bowling green that year was 3d. per game whereas a season ticket cost 7s. 6d. It was 5s. more to combine tennis and bowls season tickets. The Hall Leys park still seems to be just large stretches of grass, crossed by footpaths and with no tennis courts marked out, when this picture was taken. However, we know grass court tennis was played on the Hall Leys before the First World War (see previous image) so presumably the nets had not yet been put up. The section of the park between the bandstand and Knowleston Place would have included the bowling green, but the boating lake and paddling pool were not installed until a few years later. Matlock Town's Football Club had moved from the park to the Causeway Lane ground some years before. The stand is there, though you can hardly see it. Whilst this card wasn't posted it probably dates from the very early 1930s as the cinema house complex was built post war (1922). There is also a white house on Dene Hills which isn't shown on photographs from the 1920s. 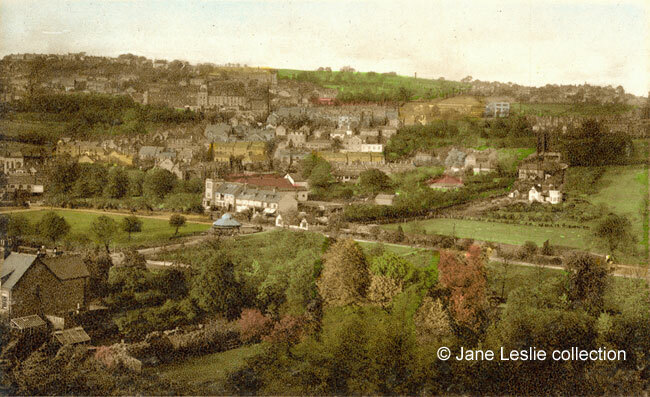 Postcard in the collection of and provided by and © Jane Leslie. Not posted. Ward Lock & Co's "Matlock, Dovedale, Bakewell and South Derbyshire", Illustrated Guide Books of England and Wales, Series 1926-7. Although I cannot provide an exact date for the move, Kelly's 1916 Directory gives us the first reference to both the Athletic Club and the Football Club sharing the Causeway Lane ground with the Cricket Club. In their 1912 Directory only the Cricket Club is shown at the venue.